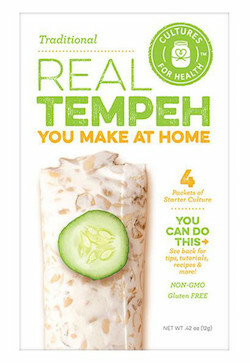 Now you can make delicious tempeh at home! Traditional tempeh is a soybean cake that has a rich smoky flavor and aroma, and a firm nutty texture. Traditional tempeh is a soybean cake that has a rich smoky flavor and aroma, and a firm nutty texture. It is a great source of protein and vitamin B-12. Ingredients: Rice, Soy beans, Rhizopus Oryzae Culture. Does not contain MSG or preservatives. Tempeh is fermented at 88ºF (31ºC), the normal outdoor temperature in Indonesia. Shelf life: Room temperature: 3 to 4 weeks, refrigerator: 6 months or more.